Security forces are evident in the Whistler area. They spent $886 million on security for the games. This is why there are over 500 soldiers stationed in Whistler for the games. Some of them hide in the backcountry, well-armed, watching. They wait for skiers to make the wrong turn and head toward the athlete village via the Whistler backcountry. The army has set up a trailer city near the athlete village complete with its own barbershop, movie theatre, and gym. Any would-be terrorist with mad backcountry ski skills knows it to be the easiest way in to the athlete village. 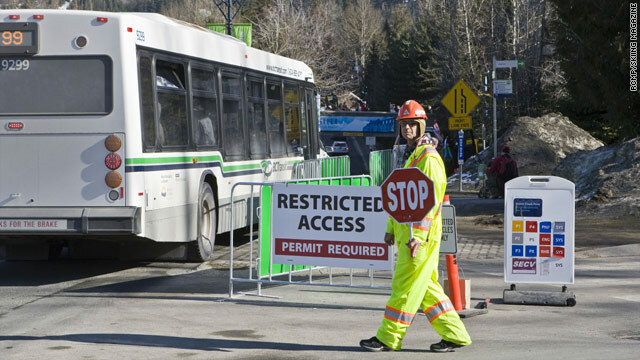 This is why a small portion of Whistler's backcountry is in lock-down mode. There have been reports of snowboarders being intercepted in the backcountry by soldiers and diverted back to the village; of spotters in trees and soldiers lower down doing the dirty work. Canadians tend to be less security-crazy than Americans and a small but vocal group of locals whined that the military presence was overkill. But on Saturday, the athlete village was presented with a legitimate security scare. A tourist found a suspiciously detailed map of the athlete village and turned it in to authorities. Police with the Olympics Integrated Security Unit said the map had ominous notes on it but wouldn't reveal the details. They then searched the athlete village with bomb sniffer dogs and found nothing but soiled spandex. I wanted to see what the histrionics were all about; what an organization with the oh-so ominous "Integrated" word in its name actually looked like; how $886 million in security spending manifests itself in the snow. I wanted to see the automatic weapons and white camouflage suits. I decided to get caught. Getting caught couldn't be too hard. So, from the top of Whistler's Peak Chair, I set off down a well-groomed beginner's run to access my favorite backcountry lap, currently under army watch. I got to the top and looked for guns and bad haircuts. Nothing. I skied down a little further and left the ski area boundary. I listened intently and waited. Silence. I waved my ski poles around and yelled "Hey!" I whacked my ski poles together and tried to look terroristy. Nobody came to get in my face. I sat down for a few minutes, and asked no one watching me in the trees where the athletes were at because I, sir, was ready to party. Crickets. I gave up on getting caught. Either they saw me and recognized that I was behaving like an idiot and was no serious threat or they weren't there. Next stop was down to Creekside, the terminus of Whistler's ski racing events. Beside it was a row of blue fencing with official logos, cheerfully explaining to all that I shouldn't even look in its direction. I did, then tried to get on the Creekside gondola. And I was denied. This was only for course workers. Even media credentials weren't good enough. But at least I'd found the so-called nefarious, wasteful, overkill security detail. It consisted of a few RCMP officers with well-groomed facial hair and a Quebecer dressed head-to-toe in a neon yellow suit wearing Elvis Costello glasses, about as intimidating as an accountant. "I'm just the checkpoint guy," he said. "But we don't expect anything to get out of hand. The police are everywhere." This is true. There are RCMP officers stationed all over Whistler. They come from all over Canada. I've seen uniform patches identifying them as constabulary from Newfoundland, Ontario, and smaller communities in British Columbia. They stand on corners and event venue margins, and a handful ski in the regulation RCMP uniform, down to the Gore-Tex yellow stripe running the length of their ski pants. Like the army, they come prepared for the elements. On every corner is a black, 40-square-foot cube -- a temporary shelter for police. The cube shelters offer the law a break from the elements, should it start raining again, and have drawn attention from the locals. They call them Pigloos.